It’s that Tamagawa time of year again over at the middle school – when excited grade 6 students first meet their buddies from Harker’s sister school in Tokyo, Japan. 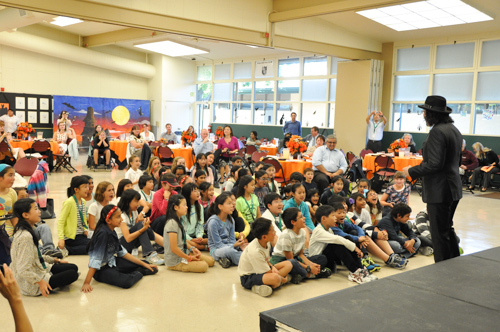 Come fall, as part of a long-running student exchange program, peers from the Tamagawa K-12 School & University arrive at Harker for a much anticipated weeklong visit. During their stay here they live in homestays with Harker students and their families, go sightseeing around the Bay Area, and spend time visiting and observing classes at the Blackford campus. This year 23 students from the Tamagawa academy were accompanied by several chaperones for their visit in early October. Highlights of the Tamagawa visit included: a field trip to a pumpkin farm, a fun scavenger hunt, creating T-shirts, playing Pictionary, participating in art, drama and dances classes, making Halloween desserts at a cooking school, working on a story/origami project and enjoying a bittersweet ice cream farewell party. New this year, Harker students were also given special permission to use Google Translator on their personal electronic devices during their time with their Tamagawa buddies. “Being a part of the Tamagawa exchange program has shown me the characteristics, culture and interests of Japanese students. I have not only learned new things, but I have made a new friend. A friend who can tell you things you never knew… A friend who you can visit in a foreign country,” recalled Harker student Grace Hajjar of her experience being a Tamagawa buddy. “My buddy’s name is Kanta Okura,” added another Harker student, Avi Gulati. “We had lots of fun. He brought waterproof UNO cards and we played with them. We went to the Japanese market together and Kanta enjoyed talking to the people who worked there. We bought his favorite food: sushi,” Gulati finished, noting that he looks forward to a lifelong friendship with Kanta. Jennifer Walrod, Harker’s director of global education, explained that the popular student exchange program between the Tamagawa and Harker schools is just one example of Harker’s rich global education program, which strives to weave global activities into its students’ daily lives. “Before you meet your buddy, they are your pen pal. You get to know them and what they like until the day you meet them … and then you take them different places to have fun and get to laugh and enjoy their presence in your life. You gain a new friend you will cherish forever,” said Hajjar. The Tamagawa School has a stated international focus on allowing students to experience differing cultures via exchange programs. “By giving opportunities for students to communicate with children overseas of the same age, global sensibilities will be fostered among our students,” states the school on its website. In the spring, Harker students will head over to Japan as part of the reciprocal exchange program. Look for further coverage on that from Harker News Online!